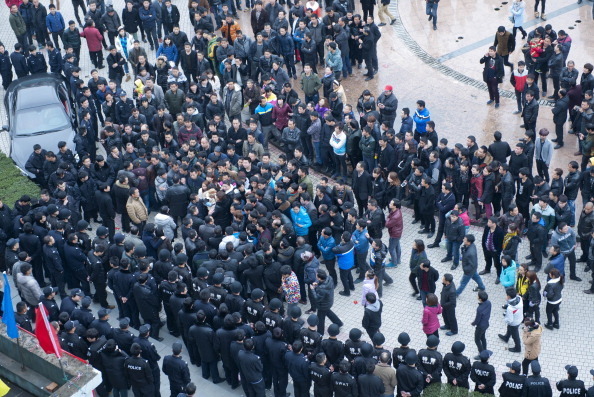 30,000 Chinese factory workers are on strike at Yue Yuen factory in Guangdong Province. By Ian Anderson and Wenchan Cao (Fightback). Although China is ‘developing,’ this is development marked by increasing inequality. Private companies and their cronies have joined with international capitalists in exploiting the Chinese working class. Although Mao’s era was harshly repressive in some respects, public management did have some benefits in terms of economic security. This security has been forcibly stripped away, in line with international attacks. State sector workers have come under attack, and many former peasants have become rural migrant workers. This has not been a completely peaceful transition. Famously, the bureaucracy violently crushed student resistance in the 1989 Tiananmen Square Massacre. Less famously, workers played a key role in this struggle. The Beijing Workers’ Autonomous Federation, a rare case in contemporary Chinese history of an independent workers’ organization, supported the student movement. The BWAF was politically diverse, with socialist currents and currents that later came to support capitalism. However, they were unified in opposing bureaucratic privilege, economic attacks, and in calling for greater democracy. The BWAF threatened a general strike. On June 4th, the CCP sent tanks into Tiananmen Square, crushing political resistance for at-least a generation. Workers were ultimately punished more harshly; while student leaders were imprisoned, workers were executed. Au Loong Yu argues this was the last organized, independent, political opposition by workers within China. However other struggles have broken out, isolated but growing. In the early part of the 21st century, thousands of workers resisted the privatization of state-owned enterprises. More recently, in 2010 tens of thousands of workers at manufacturing plants (including electronics manufacturer Foxconn, and manufacturers for Honda and Toyota) went on strike, winning wage rises. Official unions in China are part of the state bureaucracy. To carry out militant struggles, workers must either temporarily take over their union at a branch level, or form their own independent short-term organizations. This is not just an economic challenge, but a political and social challenge, a demand for free association. The CCP can always make episodic economic concessions from time to time, but it never allows political concessions, even if it is as basic as the right to demonstrate. Growing up in China, I personally experienced this social control. The material in the education system is highly limited. The ‘Marxism’ taught in schools, in contrast to the questioning and critical spirit of Marxism, teaches students never to question the party. As in many Western schools, school uniforms also enforce social repression. One ridiculous rule from my previous high school was — students are not permitted to show their legs, regardless of how high the temperature is. Sexuality is frowned upon. As a young queer woman, I could not publicly disclose my sexuality without fear of legal consequences. Any individual challenging this repression could be arrested anytime. And the CCP would claim that they are doing the right thing and helping the Chinese people to have the ‘right mind’ and be ‘mentally healthy’. However, collective resistance is growing. The current ongoing strike of 30,000 workers, at the world’s largest shoe-producing factory, is an inspiring example. Strikes disrupt the production necessary both to Chinese bureaucratic capitalism, and global capitalism. They show the power both of free association, and collective action. There is not yet an organized, sustained and independent political opposition in China. Solidarity – between workers and students, between workers at different plants, across the globe – can build on these existing outbreaks to forge a political opposition. Only organized, popular democratic struggle can pave the way for real socialism.